English, Sterling Silver Tea & Coffee Set. 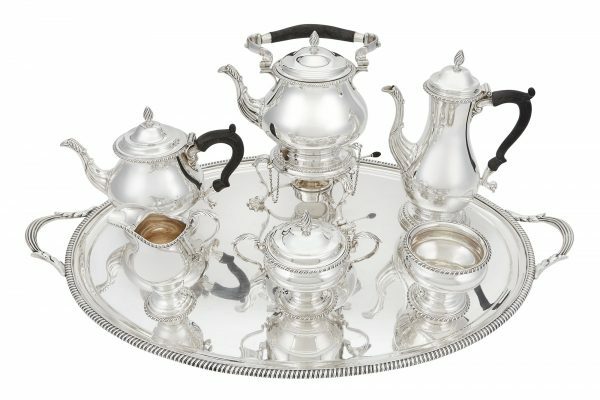 Sterling Silver 6 Piece Tea & Coffee Set In A Georgian Style. Hallmark For 1921, Ellis Jacob Greenberg For JE Caldwell. A superb style and quality, four piece, sterling silver tea set. Made in London by the famous silversmith of the Barnard’s family, Edward, Edward Jr. John & William Barnards, fully hallmarked and dated 1830. The ribbed bodies with hand chased floral decoration, and with an engraved family crest of a griffin with fish tail on one side of each item. The cast finial is also of a floral design to match the chasing on the body. Each piece stands on four scroll feet. Set consists of a coffee pot, 10.75″ tall, tea pot is 7.25″, creamer is 6.5″, sugar 5.5″ tall. The set is in almost excellent condition. Lancaster Rose, Sterling Silver 4 Piece Tea & Coffee Set By Poole. Prelude By International. 5 Piece Sterling Silver Tea & Coffee Set. Coffee Pot Is 10.5″ Tall. Set Weighs 2400 grams. A Large, Complete, Antique Sterling Silver Tea & Coffee Set Complete With Tray & Tilting Hot Water Kettle. The Entire Set Is Beautifully Hand Chased And Is All Original. Each Piece Is Fully & Correctly Marked. The Kettle Stands 15 1/4″ Tall. The Oval tray Is 31 1/4″ x 19″. Great Size, Quality & Condition. Antique English 4 Piece Tea & Coffee Set In The Desirable Melon Form. Made In London, England By Joseph & John Angell. William IV, 1834 . Each Piece Is Fully & Correctly Hallmarked & Each Is Crested With A Deer Impaled With Arrow. Coffee Pot Is 10″ Tall. In The Last Picture The Set Is Shown Sitting On Large Round Sterling Silver Tray. The Antique Tray Is Not Included In This Lot, But Is Available For Sale & Listed Separately On My Web Page. An exceptional, large, antique Victorian, sterling silver, tea & coffee service in a panelled form, complete with octagonal sterling silver galley tray. All made by Martin & Hall, one of the premier English silversmiths of the Victorian period. Hand chased & hand engraved decoration with cast mounts throughout the set. The set consisting of coffee pot, tea pot, sugar bowl, cream jug & tilting hot water kettle on stand with burner all sits on this beautiful hand engrave, large, octagonal gallery tray. All pieces are fully & correctly hallmarked. Tray is 28″ wide. The kettle stands 17 1/2″ tall. The firm exhibited at the 1851 Great Exhibition, the Internation Exhibition (1862), the Sydney Exhibition (1879), the Melboune Exhibition (1881) and the 1915 British Industries Fair. The origin of the firm is in the partnership established in 1820 in Sheffield by Henry Wilkinson and John Roberts who traded as Wilkinson & Roberts. Wilkinson left the business in 1836 and in 1846 John Roberts entered in partnership with Ebenezer Hall (his apprentice in 1836) under the style Roberts & Hall. In 1854 entered into the partnership Richard Martin (of Martin Brothers & Naylor) and Joshua Hall (brother of Ebenezer Hall) under the style Martin, Hall & Co. In 1866 the firm was converted into a Ltd. The factory was active at Shrewsbury Works, Broad Street Park, Sheffield with showrooms in London (where they were listed as manufacturing silversmiths and electroplated manufacturers, silver, plated and steel cutlers), Sydney, Birmingham and Glasgow. Items made by Martin, Hall & Co were retailed by Wordley & Co – Liverpool, Ball & Edwards – Birmingham, Henry Ellis & Son – Exeter, Charles Nephew & Co – Calcutta, West & Son – Dublin, Goldsmiths Alliance Ltd – Cornhill, Pearce & Co – Leeds, Mappin Brothers – London, George Edward & Sons – Glasgow, James Aitchinson – Edinburgh, Mackay & Chisholm – Edinburgh and many other firms. 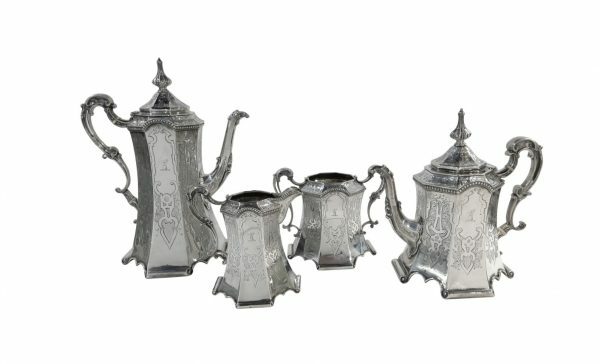 Antique Victorian, Sterling Silver Tea & Coffee Set, In The Desirable ‘Louis Pattern’, Made By Martin & Hall, Circa 1856. Beautiful Hand Chased Decoration, With The Cast Louis Mask Spout & Eagles Beak, And A Cast Eagle Finial On Covers. Large Size, Typical Of The Victorian Affluence. Made By One Of The Premier Silversmiths Of The Victorian Period. Each Piece Is Fully & Correctly Hallmarked, And Each Is With A Hand Engraved Crest & The Motto “Mani Forte” Translates As With A Strong Hand. This Was The Crest Of The Clan MacKay Which Was An Ancient & Powerful Scottish Clan, Tracing Their Roots Back To The 13th Century. A Magnificent Tea Service, Both Decorative Yet Usable. The Tilting Kettle On Stand Is 17.5″ Tall. Just One Of A Huge Selection Of Tea & Coffee Sets As Well As Other Silver Always Available For Sale At Our Manhattan Gallery. Seven-piece George V Sterling Silver Tea and Coffee Service, London, 1930, By Lionel Alfred Crichton, each with a squat urn-form body, stylized body. Set consists of; kettle-on-stand with burner, teapot, coffeepot, chocolate pot, creamer, covered sugar, and open waste bowl, kettle-on-stand ht. 13 1/2 in., approx. George Jensen, Sterling Silver Tea Strainer. Acorn, designed in 1915 by Johan Rohde. 6.75″ long. Antique Victorian Sterling Silver Tea Set. This beautiful Victorian silver set is complete and original, comprising tea pot, coffee pot, cream jug, sugar bowl and large tilting hot-water kettle. Each piece is beautifully hand-chased with six flat panels and a delicate floral decoration. The kettle, teapot and coffee pot all have hinged lids with the classic Victorian embellishment of cast eagle finials.The kettle sits on a cast stand with barrel pins that allow it hinge forwards while pouring so that it does not have to be removed from the stand.